What's up! Haven't seen you on in about 200 years! right on man, good to see you're still kickin'. Just a hardy welcome back to you! I hope you stick around for a bit Dustin. See ya in the threads! Wondering through a random thread and saw a Gamble post. Had to rub my eyes, refocus, and make sure. I knew I wasn't that drunk. Mayo approves your choice of culinary delight. We've missed you. Well, at least I have. Most of the old AVSTUD is still here, but a lot has changed. Or at least it feels like it. When did this happen, and why wasn't I informed? Nice to see you active again dude. Or do you like the new one? 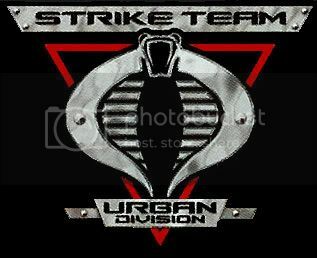 Alley Viper attached to the Strike Team Urban Division 82nd. Cobra wants you! I'm looking for some ruthless Vipers to fill the ranks. Joes need not apply.